One my favorites, of all French pastries, is the financier. Enriched with nuts, and moistened with butter, almost every bakery you go into has them. 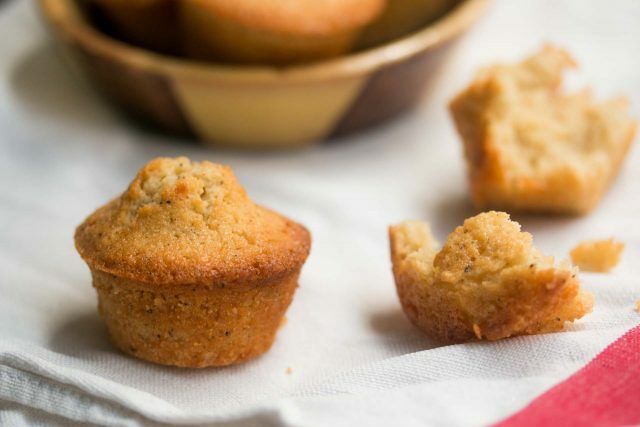 They come in different sizes, shapes, and even flavors; almond is the most popular, but you’ll sometimes come across financiers made with ground hazelnuts or pistachios. I like them all. There are a few theories how this mini-gâteau got its curious name. One is that, traditionally, they’re baked in small, rectangular molds. Once baked and unmolded, the little cakes resemble bars of gold. Another is that even adults in France are known to indulge in an afternoon sweet stop at their local bakery, for their goûter. Because people who work in the financial industry normally wear nice outfits or suits, something that’s neat to eat is appreciated, so they can stay presentable when heading back to the office. I don’t have to worry about that, nor has anything come out of my oven turned to gold. (Quelle dommage!) But when I found myself with some leftover brown butter from infusing it in bourbon for Brown Butter Old Fashioneds, since I treat butter like gold, instead of tossing it, it got repurposed as a base for a batch of financiers. So after you brown the butter, when pouring it out of the pan, you don’t want to scrape up too much of the dark bits at the bottom of the pan, but I don’t mind a few in my cakes (in fact, I prefer them), so don’t fret too much about having a few in your batter. These cakes are also very forgiving, which is why so many bakeries in France offer them. They’re easy to make, keep well, and are the perfect afternoon snack – or as the French say, un snack. 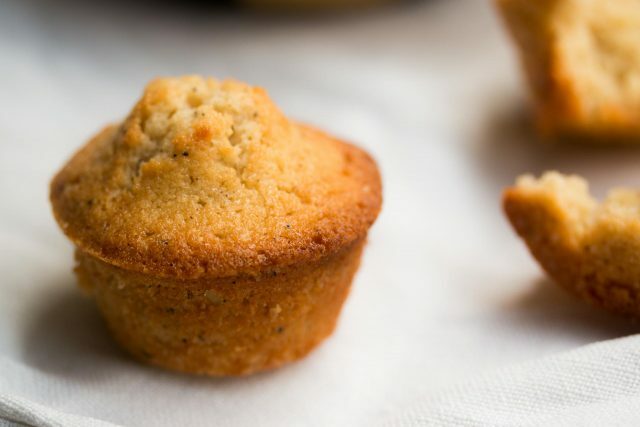 For financiers, I use mini-muffin tins, which are easily available. I'm not a fan of silicone bakeware but know that some people like it. This batter is pretty forgiving so can be baked in madeleine molds or even in larger muffin tins, filling them only about halfway. If you use another size mold, you'll likely need to adjust the baking time; bake them until browned on top, and the feel just set in the center when you touch them.As mentioned, I made these with leftover brown butter from the Brown Butter Old Fashioned recipe. I started with 4 ounces (8 tablespoons/115g) of butter, which yielded the amount called for in the recipe. If starting from scratch, and making your own brown butter, start with that amount of brown butter, then you can measure it out when it's browned and cooled. (If you need a bit more butter, you can simply add a bit of melted butter to it, to reach the 2 1/2 oz/75g amount. 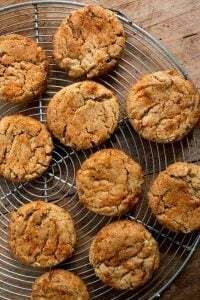 There are links at the end of the post with detailed instructions on making brown butter. 1. 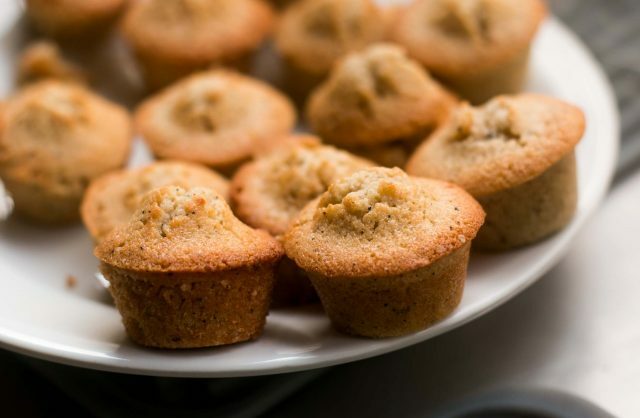 Preheat the oven to 375ºF/180ºC and butter the insides of 24 mini muffin tins generously with softened, not melted, butter, making sure the butter the upper rims of the indentations. 2. In a medium bowl, mix the almond or hazelnut powder, sugar, flour and salt. Stir in the egg whites and vanilla or almond extract, then the browned butter. 3. Fill each indentation of the mini muffin tins almost to the top. Rap the tins sharply on the counter to level the tops, then bake for 13 minutes, until nicely browned. Let the financiers cool in the tins, then remove them, using a sharp knife to help release them, if necessary. Storage: The financiers can be stored in an air-tight container for up to one week. They can be frozen for up to two months. I make these all the time and wrote them up on FOOD52 when the Cookbook Club was cooking through My Paris Kitchen. The recipes are clear, and the results are sublime. One of my favorite treats! I love to pop a raspberry on the top of each of mine. Are the egg whites whipped before being added? The recipe as written sounds like you just add the gloopy egg whites…..unusual. They’re not whipped, just added in their liquid form. Financiers are one of my favorite cookie in the world! I love the texture that is somewhat between a small cake and a soft cookie, and it’s absolutely the best. These ones look especially delicious and I just can’t wait to try them. I love these!!!! I made them once in mini muffin tins and once in silicone financier molds. The mini muffins were much better, had more substance, the silicone mold indentation was too shallow I think so there wasn’t much “cake” to it. In one batch I added a dot of Nutella which my kids loved, they were delicious!!! Question: The recipe does not indicate whether to use all purpose flour or cake flour. Does it matter? 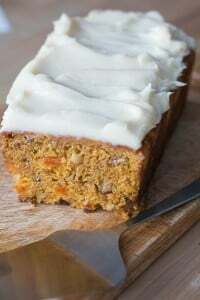 For this recipe in particular, and other baking in general? I have both flours, and if not stipulated I am never sure which flour I should use. Please and thanks! Yum! My downfall is always anything chocolate, but I never say no to a financier. Any idea why my madeleines stick to the mold? It seems to be nonstick, and I slathered it with oil, butter and butter/flour (washing and drying between batches). Sigh. I have had the best luck with specialty baking spray for madeleines :D Ghee is next best, then oil, then butter. I think the dairy solids are to blame. When the cakes come out of the oven, insert the sharp tip of a thin bamboo skewer between the cake and the pan, lifting each cake a little but leaving them in the pan until they cool down. This works for me each time, Madeleine or Financier. I just got some mini Madeleine molds — may try those! I just made a chocolate version, but these are next! Thank you so much for sharing your recipes and stories. I do have one question: since there’s very little flour in the recipe, could you sub for another gluten free flour? 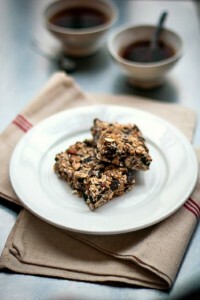 I’d love to make these for family members that are celiacs! Oh, the mystery is solved! Someone brings a delectable almond flavored pastry in this exact shape to an event I attend every week. I couldn’t figure out what they were, since they’re not quite a muffin and not quite a macaroon. I’m delighted to have the recipe. And being a New Yorker, I actually already have the mini muffin tins because someone left a bunch of their unwanted baking supplies in the laundry room in my apartment building. I have to bring a treat to a five day long dance festival that will be served on the last day, and these will be perfect. Everyone brings gorgeous homemade leftover Christmas goodies and I want mine to be equally splendid! Made your Swedish Meatballs last night – scrumptious! Oh, yum! I have some new friends here in Paris who served me these just a few days ago — I had never heard of them before, but just loved them. And they’re so cute, too! These are fantastic! I knew as soon as I scanned the recipe that they were right up my alley – I’ve been putting almond extract in so many sweets lately. People always so, “wow, what’s in these?” I love that they have so little white flour. Excellent taste and texture. Already decided to make them for my family Christmas breakfast. Thanks David. These look fantastic! I have a question, tho. The Almond cakes with browned butter recipe in My Paris Kitchen call for chilling the batter before baking. Since the recipes are very similar, I’m wondering if you discovered that the chilling was no longer necessary? These are truly delicious and so quick to make. I’ve been looking at other recipes for financiers and notice that many of them use powdered sugar. I wonder why? Do you think regular sugar changes the consistency? How do you get the lovely too knot in the pastries shown in the pictures? Mine were delicious but somewhat flat in appearance. Often you get those when the indentations are filled almost all the way to the top. Depending on the exact size of your mini muffin tins (I’m sure they vary considerably), perhaps yours were less-full than mine, because of that. 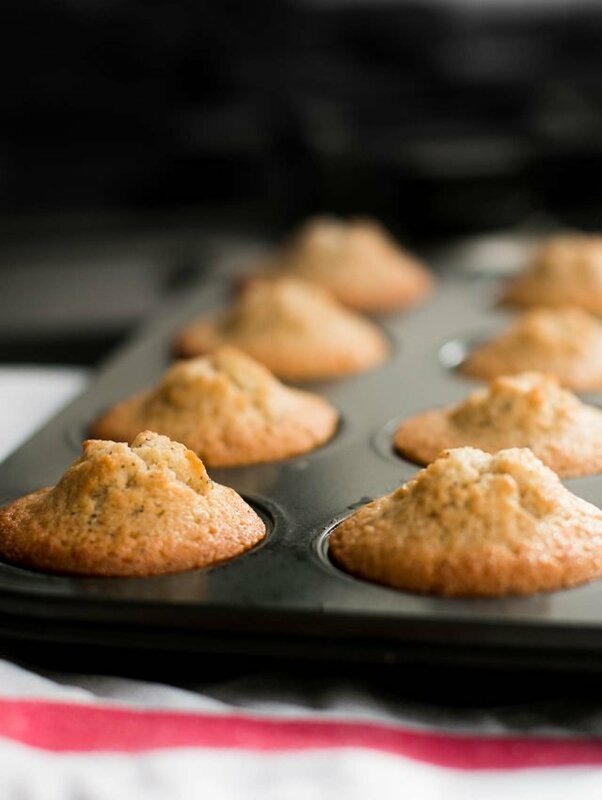 I found a few articles on the internet about muffin crowns that were interesting reading: Bakery-style high domed muffins, and How to Make Cafe-style Muffins. (One of their advisements was to fill the indentations almost up to the top as well. Your financiers look positively scrumptious and I can’t wait to try them! Happy Holidays to you and yours! Can I reduce the sugar? These were a bit sweet for my taste. Sure. They’ll be less-moist but you can do it if you’d like. Perfect. Now I have something else to make with all those frozen eggwhites left over from making your ice creams! Thanks David. I’ve made these twice now with fantastic results. Thanks for this terrific recipe David. I spring for good butter and it makes all the difference. And mini muffin tins really do vary in size! Round one I ended up with a perfect 24 and the second time I made them using my mom’s mini muffin tin I had to make another half batch to fill them out!